Bangalore-based VH Education Pvt Ltd which owns and operates hiring startup Venturesity, has raised $250,000 from a group of angel investors, including redBus co-founder Phanindra Sama and California-based Crestlight Venture Partners' Jay Sethuram, according to a report by The Economic Times. Founder and CEO of Torrent Networking Technology Hemant Kanakia and founder of angel fund and incubator Srijan Capital, Ravi Trivedi also participated in the round. Multiple mails/messages sent to the company for comments elicited no response. The company was founded in May 2013 by Subhendu Panigrahi and Prashant Koirala. While Panigrahi is an IIT Kharagpur alumnus, Koirala has a degree in finance from University of Maryland, Robert H Smith School of Business. The startup creates challenges for job seekers specific to job description provided by different companies. It makes them do projects in order to showcase their job skills to prospective employers. According to the company, resume is passe. It conducts activities such as hackathons, codesprints and online contests to shortlist job seekers. These challenges address critical skills in areas of new technologies and business. They are set by industry experts who are interested in hiring new talent for their organisations. It claims that over 200 companies such as NewsHunt, Oracle and PayUMoney are hiring through its platform. The startup also hosts workshops and boot camps. 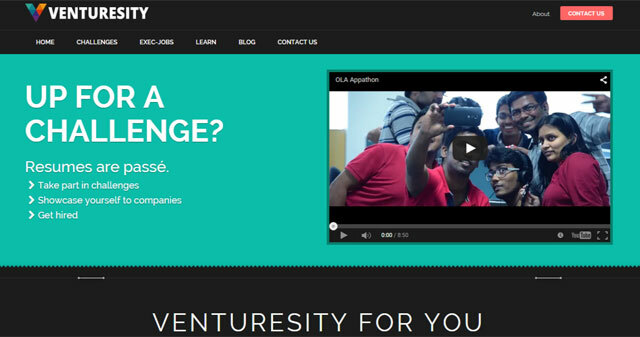 This year, it conducted hackathons for companies like Ola, Stayzilla and Housing.com. Other interesting startups in the job hunt space include HackerEarth and myNoticePeriod. In January, HackerEarth had also launched a tool for conducting coding tests and hackathons. myNoticePeriod, on the other hand, had raised $3 million in a Series A round of funding from IDG Ventures last year. Venturesity VH Education Pvt. Ltd.